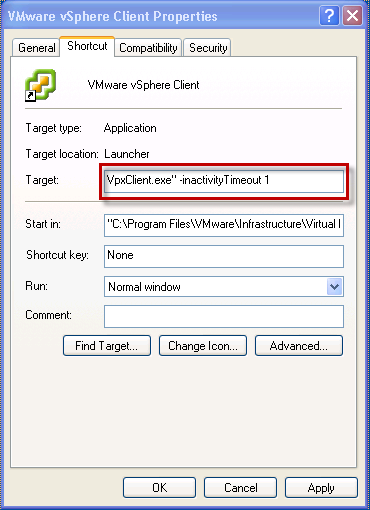 I recently came across an interesting VMTN thread in which I learned about a neat little feature that allows a user to configure an inactivity timeout for the vSphere C# Client. Once the timeout value has been reached, the vSphere Client will automatically disconnect from the server(vCenter 5.0 or ESXi 5.0 Server). This feature looks to have been introduced with the release of vSphere 5 and was noted in thick-client-timeout guideline in recent release of the vSphere 5 Security Hardening Guide to help reduce the risk of unauthorized access. To configure using the command-line argument, locate the vSphere Client executable on your desktop and right click and select properties. You will need to add -inactivityTimeout X, where X is the number of minutes before the vSphere Client will automatically disconnect from the server. 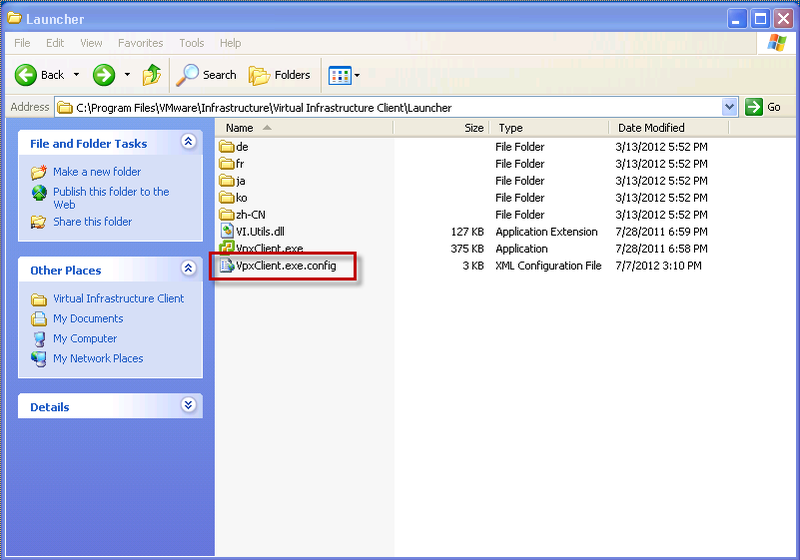 To configure using the vSphere Client configuration file, you will need to locate the VpxClient.exe.config (thanks to user regnak2012 for identifying the required XML entry). Next, you will need to right click on VpxClient.exe.config and edit the file using an editor such as notepad. Add the following entry right above the cmdlineFallback, where X is the number of minutes for the timeout value and save then save the file. To validate that inactivity timeout value works, just connect to either a vCenter Server 5.0 or ESXi 5.0 Server and wait for it to disconnect after the timeout value has been violated. In this example, I configured it for 1 minute and you should see the following screen below once it has disconnected. Since this feature is client side only, a user can easily change or update this timeout value. One option to guarantee this configuration is by ThinApp-ing your vSphere Client, this way you can control who has access and what the inactivity timeout should be. This can really help when it comes to auditing client side system. While looking into the vSphere Client options, I also came across a few others that are not documented but might come in handy. Disclaimer: These are not officially supported by VMware, please use at your own risk. You can automatically ignore this message by specifying the -i command-line option OR add in the VpxClient.exe.config file. Expand Inventory - If you want to have your entire vSphere inventory automatically expanded out for you each time you login (this may not be a good idea for very large environments) you can specify -expAll command-line option OR add in the VpxClient.exe.config file. Disable All vSphere Plugins - If you want to prevent any vSphere Plugins from loading, you can specify -noPlugins command-line option OR add in the VpxClient.exe.config file. I have a question in case you already have the answer. After the timeout and while the re-login message waits for a response, CPU/MEMORY resources of the system are still reserved. Is there anyway that after the inactivity timeout, also the application will exit?